'Tulip Four' is a restaurant concept that originated from the project brief of creating an innovative restaurant with a strong layout and readability. 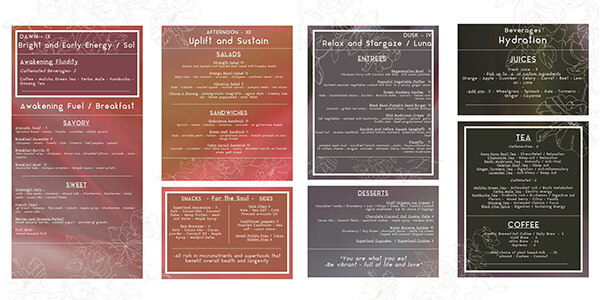 Project Brief: Design a multi-page menu for a restaurant, cafe, or bar. This can be a restaurant concept that you’ve developed yourself, or a redesign of an existing real-world restaurant brand or concept. I wanted to create a restaurant that had food that not only tasted good, but focused on specific benefits for each time of day, or what health benefit you want to achieve for your body. I spent a lot of time working at organic restaraunt over the summer where everyone would always say the food is "to die for." However, I think that food should be To Live For," a unique positive wordplay for the celebration of health and wellness. 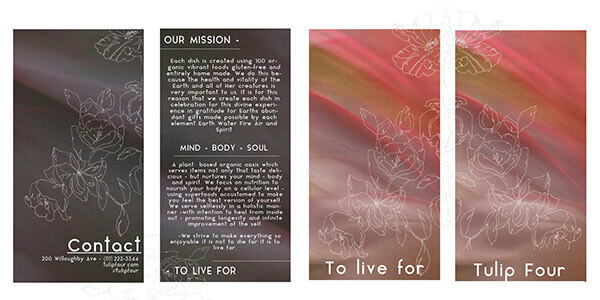 "To Live For," sounds like "Tulip Four," so I could incorporate an elegant floral theme for an intimate feeling in an organic restaurant.